"...On one hand, its theology is based on nothing outside the scriptures. On the other hand, the doctrines agree in all parts with those of the Early Church i.e. the tradition which has the proper interpretation and application of the teachings of our Lord and the Apostles as understood and practiced by the Christians and the leaders of the Church during the period of the One Universal Church until the division of 451 A.D."
The Coptic Church was established in the name of the Lord Jesus Christ by St. Mark the Evangelist in the city of Alexandria around 43 A.D. The church adheres to the Nicene Creed. St. Athanasius (296-373 A.D.), the twentieth Pope of the Coptic Church effectively defended the Doctrine of the Lord Jesus Christ's Divinity at the Council of Nicea in 325 A.D. His affirmation of the doctrine earned him the title; "Father of Orthodoxy" and St. Athanasius "the Apostolic". 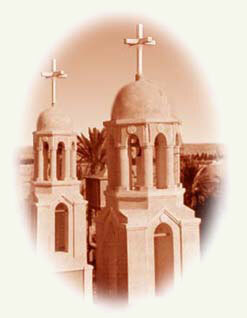 The term "Coptic" is derived from the Greek "Aigyptos" meaning "Egyptian". When the Arabs arrived in Egypt in the seventh century, they called the Egyptians "qibt". Thus the Arabic word "qibt" came to mean both "Egyptians" and "Christians". The term "Orthodoxy" here refers to the preservation of the "Original Faith" by the Copts who, throughout the ages, defended the Old Creed against the numerous attacks aimed at it. The Coptic Orthodox Church believes that the Holy Trinity: God The Father, God The Son, and God The Holy Spirit, are equal to each other in one unity; and that the Lord Jesus Christ is the only Savior of the world. Less changes have taken place in the Coptic Church than in any other church whether in the ritual or doctrine aspects and that the succession of the Coptic Patriarchs, Bishops, priests and Deacons has been continuous. As the Church grew in Egypt, it became known as the Church of martyrs. Beginning in the year 202 AD under the reign of Septimus Severus, the church suffered severe repression and persecution, with the influential School of Alexandria forced to close, and its dean, Saint Clement forced to flee. The repression towards Christianity continued under the reign of the Roman Emperor Decus who issued an edict to reesetablish the state pagan religion at any cost. In 257 AD, Emperor Valerian issued edicts to destroy the church, Pope Dionysius was arrested and sent to exile. In 302 AD, the Roman Emperor Diocletian began what was to be the most severe persecution towards Christians. He dismissed every soldier in the army who refused to worship the Roman gods. Determined to crush Christianity in Egypt, 800,000 men, women, and children were martyred for their belief in Jesus Christ. In commemoration of these martyrs, the Coptic Church begins its calendar from 284 AD, the year that Emperor Diolcletian became the Emperor. The Coptic calendar is known as the “Year of the Martyrs” (or anno martyrii, AM) with 2004 as the year 1720-1721 AM. 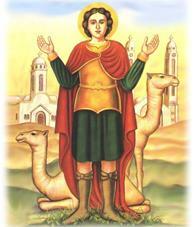 Saint Mina is one of those who gave up his life because of his faith. Long before the establishment of Christianity in Egypt, Alexandria was famous for her various schools, among which was the "Museum," the greatest philosophical school in the East, containing in its library between two hundred thousand and half a million books and manuscripts. It was a unique centre of a brilliant intellectual life where Egyptian, Greek and Jewish cultures were taught. As recorded by Saint Jerome, Saint Mark himself founded the School of Alexandria. He established the School for the teaching of Christianity in order to provide it as a firm foundation for the city. In time, the school became very famous; it was the oldest centre of sacred sciences in the history of Christianity. Many prominent bishops from different parts of the world were instructed there, and it introduced into the world many scholars and saints, such as Athenagoras, Clement, Saint Dionysius, Saint Peter the Seal of Martyrs, Saint Didymus the Blind, and the great scholar Origen, who was active in the field of commentary and the comparative study of the Bible. Monasticism began in the Coptic Church towards the end of the third Century, and flourished in the fourth. There were hundreds of monastaries and thousands of caves in the mountains of Egypt. For the monks, monasticism was the life of prayer, contemplation, solitude, worship, and purity of heart. They had nothing in their minds, hearts and feelings except God. They lived the calm and quiet life abiding in the Lord, detaching themselves from everything and everyone, in order to be attached to Him alone. Saint Paul, of the lower Thebaid in Egypt, was the first hermit. In 250 AD upon the death of his parents when he was 16 years old, he inheritred great wealth. He fled to the desert where he lived over 90 years. Each day, a raven would bring him one hald of a loaf of bread for his sustenance. 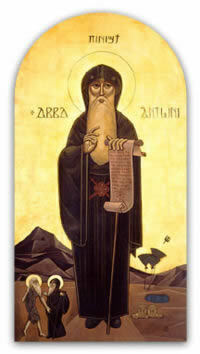 The most famous Coptic monk was Saint Anthony, who was born in Middle Egypt. He was 18 years of age when he entered a church and heard the words of the Gospel, "If you want to be perfect, go, sell all you have and give to the poor; and come follow Me." (Matthew 19:21). In obedience, he sold his land, entrusted his sister to a community of virgins, and lived in a hut unde the guidance of a recluse. He visited Alexandria in 316 AD to assist the martyrs, and in 352 AD to help Saint Athanasius in his fight against Arianism. Saint Anthony was a great leader of thousands of monks in Egypt in the fourth cenutry, and many of his disciples also came from the West, after hearing of his inspirational life; for this reason he is considered all over the world, until today, as the "father of monasticism." Other famous Coptic monks include Saint Syncletica who founded the first monastic community for women in the world in Alexandria. Her biography and teachings were preserved by Pope Athanasius. Coptic Monasticism is considered the most profound spiritual revival in the history of the Church. The news of the spiritual life of the monks spread to every part of the world despite the fact that they did not write about themselves, and for this reason, there is no Coptic history of the Coptic monks. Despite this fact however, people came from all over the world in order to hear a word from one of the monks, and to take it as a word of spiritual guidanc and benefit throughout their lives. Saint Palladius visited many monks and wrote his famous Paradise of the Fathers from which we learn about these holy fathers. They were not preachers, but they were living sermons, and were examples of the true spiritual life. They were the image of God on earth. He received his bachelor's degree in pharmacy in 1975 from Alexandria University and earned a fellowship for the World Health Organization from the British International Health Institute in England in 1985. He attended the Coptic Seminary and graduated in 1983. He then worked as a manager in a pharmaceutical company in Damanhour that was owned by the Ministry of Health. His Holiness's life has always revolved around church since his youth; he wished to live the life of monasticism. He entered the Monastery of St. Pishoy in Wadi Elnatroun on August 20, 1986 and remained a brother for two years. He was ordained a monk on July 31, 1988 and after a year he was ordained a priest on December 23, 1989. Two months after, H.H. Pope Tawadros started serving with H.E. Metropolitan Pakhomious of Beheira on February 15, 1990. He was ordained a bishop on June 15, 1997 by H.H. 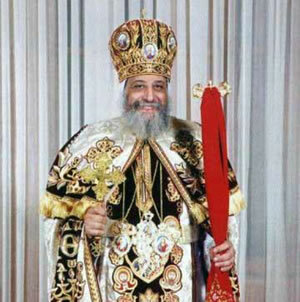 the Late Pope Shenouda III as a General Bishop assisting H.E. Metropolitan Pakhomious. His Holiness focused on childhood whether it was in the country-wide children's festival as well when he was in charge of the children's committee in the Holy Synod. Before assuming the papacy, H.H. wrote twelve books. To learn more, visit His Holiness Pope Tawadros' Official Web site.